Making Life Easier with Universal Home Design – Allrounder Remodeling Inc.
Universal Design is a concept in home design. The idea is that there are little things that you can do within your home to make the home easier to use for persons of all abilities, thus making the home more “universal”. 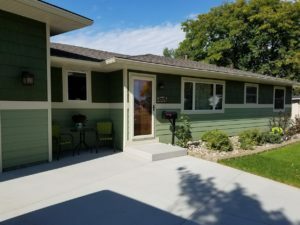 The concept gets its roots from the Aging in Place concepts of the past, which is a design concept of adding features to allow a person to stay in their home as they get older and less physically capable. Some Universal Design ideas are one-floor living, no or minimal step entries, better lighting, grab bars in bathrooms, lever handles instead of knobs on doors, more thoughtful doorways, minimal or no transitions in the flooring, and placing electrical switches and receptacles at more favorable heights. Let’s take a brief look at some of these ideas. One-Floor Living. This is probably the most important concept. Having all of your living spaces, kitchen, bathroom, bedrooms, and laundry on the same floor means that you don’t need to go up and down stairs to get to your spaces. If you live in a two-story or split-level home, consider moving to a rambler or single level home. Entries. The easier it is to get into your home, the better. Design sidewalks and entry points to minimize or eliminate the number of stairs needed to get into the home. Grab Bars. This item receives more pushback from clients than any other. We often hear comments such as “that stuff is for old people” or “We’ll just move when we get to the point where we need those things”. 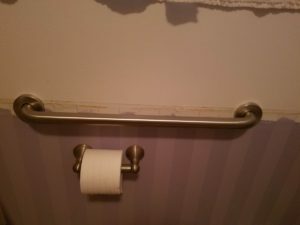 After Ruth broke her foot a few months ago, we suddenly found ourselves needing multiple grab bars in our bathroom. So naturally, we did what most people in our situation do: We ran to the store and bought the least expensive “hospital style” grab bars and quickly installed them so that Ruth could use the room safely. And it looks like we did just that. Manufacturers have designed some great looking grab bars that look more like a towel rack. 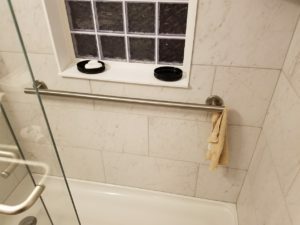 With a little foresight, these designer grab bars can be installed and used as towel holders without being that noticeable. I actually find myself using them to steady myself in the shower, even though I’m supposedly young and able bodied. Poorly planned grab bar installed under duress looks like an afterthought because it is! Door Levers. This item hits home for me personally, as I’ve developed tendonitis in my hand. 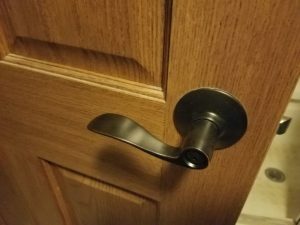 This condition makes it very difficult to grasp and turn a door knob. 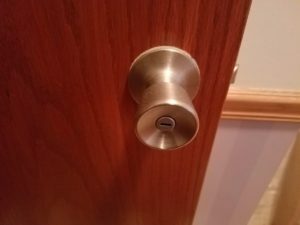 The lever style handles are far easier for persons of all abilities to simply push down on to open a door. Lever handles are easier to operate, even with your hands full! Better Lighting. Our home was built in the 1950’s, and most of the rooms have a single ceiling light or no lights at all with a receptacle controlled by a switch, which we are supposed to plug a lamp into. As we get older, our eyes have a harder time seeing in these dimly lit rooms. Adding light helps people of all ages to see well. This is why we tend to specify a lot of lighting in our projects. Doors. A conventional swinging door takes up space within the room. A pocket door or sliding door does not add to the footprint of the room. This is another concept that we faced when Ruth broke her foot. Adding crutches to a person increases their width by several inches. Older houses like ours have narrow bathroom doorways to start with, and the crutches made it difficult to get through the narrow doorway. We actually had to remove our bathroom door for a few days until Ruth got used to the crutches. Whenever possible, we try to specify wider doors and/or pocket doors, which provide more space for getting in and out of a room. Floor Transitions. Very few homes have the same continuous flooring throughout. Often times, Carpet will abut wood or tile. 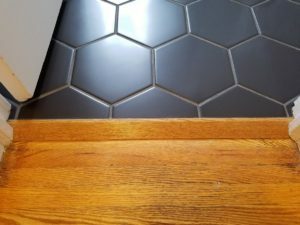 In these transition areas, the different flooring materials are at different thicknesses or heights, which can cause toe-stubbing or tripping hazards. Whenever possible, we try to eliminate these transition areas. When a transition is needed, we try to “ramp” it rather than having an abrupt jog in the flooring height. 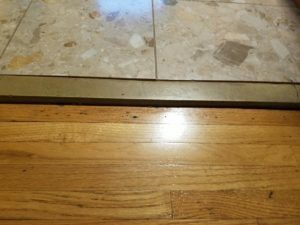 We try to avoid toe-stubbing floor transitions such as this one, which poses a tripping hazard. Electrical Devices. For years, the “standard” heights for electric receptacles has been 12” off of the floor. There is no code or requirement that they be at this height, it’s just the way it’s always been done. This height requires a user to bend over to plug something in. Consider placing receptacles higher off the floor to save the backaches of bending over. Likewise, switches located at the typical 48” height off of the floor are convenient for persons who are standing. However, somebody in a wheelchair or scooter may struggle to reach switches at this height. Consider placing the switches at a lower location on the wall to make reaching them easier for everyone. In addition, consider the decora-style switches, which can be operated without needing to curl your finger under it. Many young clients are reluctant to incorporate universal design ideas into their homes, thinking that these concepts are only for the old or disabled. We’ve learned firsthand that your physical condition can change in a moment’s notice, and having some of these concepts in place before you need them will make life easier for persons of all abilities. 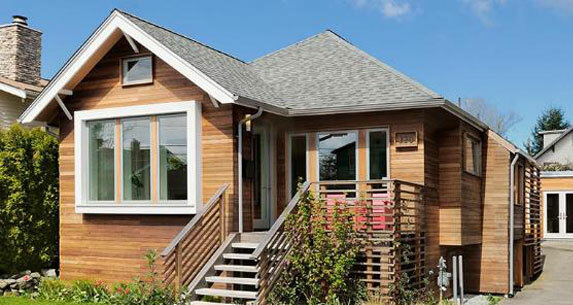 When working with us to plan your remodel, ask what Universal Design features may be of benefit to you and your family.